BANFF — As crews continue to battle a wildfire on the western edge of Banff National Park, a fire specialist with Parks Canada says there's no immediate threat to towns in the Bow Valley. Last Saturday, a lightning strike started a wildfire in a narrow valley at Verdant Creek in Kootenay National Park in B.C. The fire grew to at least 2,000 hectares — or 20 square kilometres in size — and spread into Assiniboine Provincial Park on Sunday when there were extremely high winds. "It currently sits 2.5 kilometres from the Sunshine ski area on the other side of the Continental Divide," Jane Park, a fire and vegetation specialist with Banff National Park, said Tuesday. Some fire protection measures, including sprinklers, were set up to protect the buildings at Sunshine Village on Monday and an assessment is underway for cabins and huts in the Banff backcountry. The wildfire, which is in extremely steep and rocky terrain, is still classified as out of control. Park said the most active spots are in Assiniboine Provincial Park but they are working with the province to manage the fire. "We did heavily bucket and continue to heavily bucket that eastern area that is most active," explained Park, who noted the fire is mostly being attacked from the air because it's difficult to get crews on the ground due to the terrain. A total of 50 firefighters and five helicopters are fighting the Verdant Creek wildfire. Other than poor air quality, Park said there's no current threat to communities in the Bow Valley. "We are monitoring this fire in proximity to Banff, Canmore, Harvey Heights, Lake Louise — all of the communities in the area — and if there are threats with respect to any of the communities, there will be lots of updates," she said, noting they did some emergency planning in the spring and are well prepared. It's about 24 kilometres from the Banff townsite and even farther from Canmore. "Obviously conditions can change," she said. "At the moment, it is across a mountain range and a couple of valleys away from the Bow Valley and we do have trigger points identified in terms of evacuations and notices. "We would be proactively planning that well in advance of needing it," added Park. As a precautionary measure to reduce the risk of additional wildfires, a fire ban is now in place for all campgrounds (both in the front country and in the backcountry) and day-use areas in Banff, Yoho and Kootenay national parks. 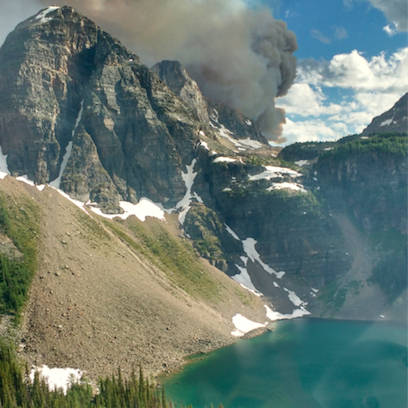 Two smaller fires are burning in Yoho National Park, where two additional crews and a helicopter are working to extinguish the blazes. The fire danger across the mountain parks is rated as high to extreme.